Many transactions are happening online with the result that users are frequently asked to key in personal particulars such as home address, credit card numbers, social security numbers, telephone numbers, etc. This makes users increasingly vulnerable to identity theft and fraud. The victim of identity theft can really suffer terrible consequences if he or she is held accountable for the perpetrator’s actions. To protect your identify which is unintentionally stored or left over on your computer due to your online activities being leaked out to identity hackers or other cyber criminals, users can take preventive action to scan their hard drive from time to time and delete off this sensitive information via security tools such as Identity Finder. Identity Finder is a free Windows application that offers an additional layer of protection against identity theft due to virus attacks, hacking, malicious programs or the activities of other users who can access the same machine. This free utility will do a comprehensive scanning on all folders, files, browser data, etc in users’ hard drive for sensitive information such as credit card numbers and passwords. Identity Finder will show users the scanned result and features a few additional built in options for users to take further action on the sensitive data. Identity Finder offers users the use of free PII removal tools to store passwords in a secure Password Vault, shred any file including their vulnerable Recycle Bin, encrypt any file with a password, and clean up users’ Web Browsers. Users who are worried they might store the above mentioned sensitive data in their computer can try using Identity Finder by downloading it via the link here. 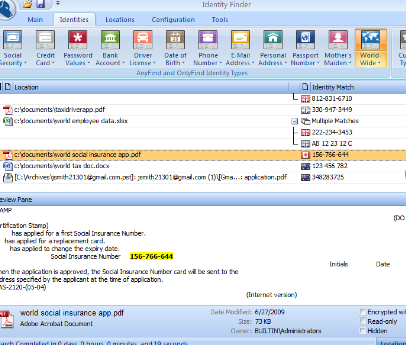 The free version of Identity Finder is limiedt to searches on credit card numbers and passwords stored only. Users who want more features such as extending the search ability to other sensitive information such as bank account, social security numbers, etc can get the pay version.